Spring is about to spring! This is a lovely time and a favorite season of many because of the life sprouting and growing. It can also be a fun time in the home as well. Are you prepared to decorate your house to reflect the new season of the year? Many people use the beginning of spring as a time to “spring clean” and spiff up their living environment with new decor, plants, scents, and more. But have you thought of the outside of your house? 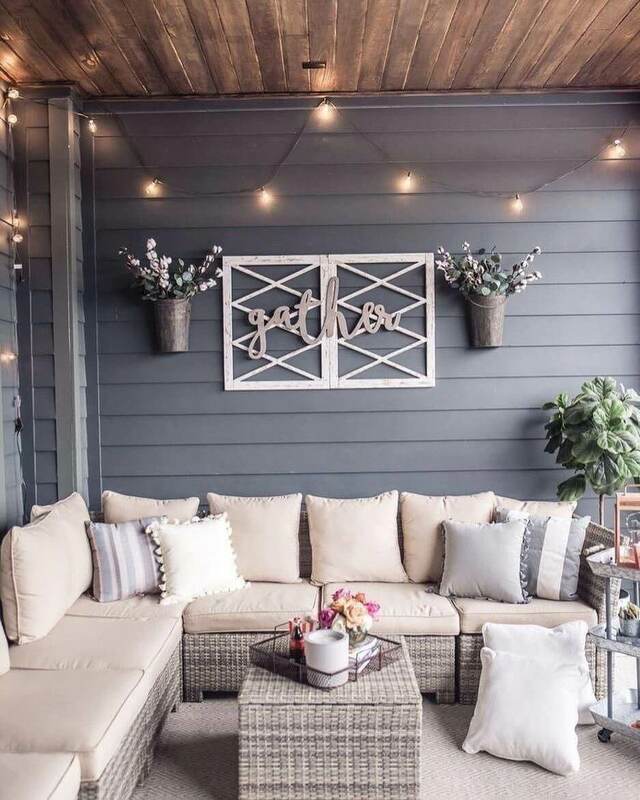 The porch can be a lovely place to put beautiful, cute, or thoughtful decorations. 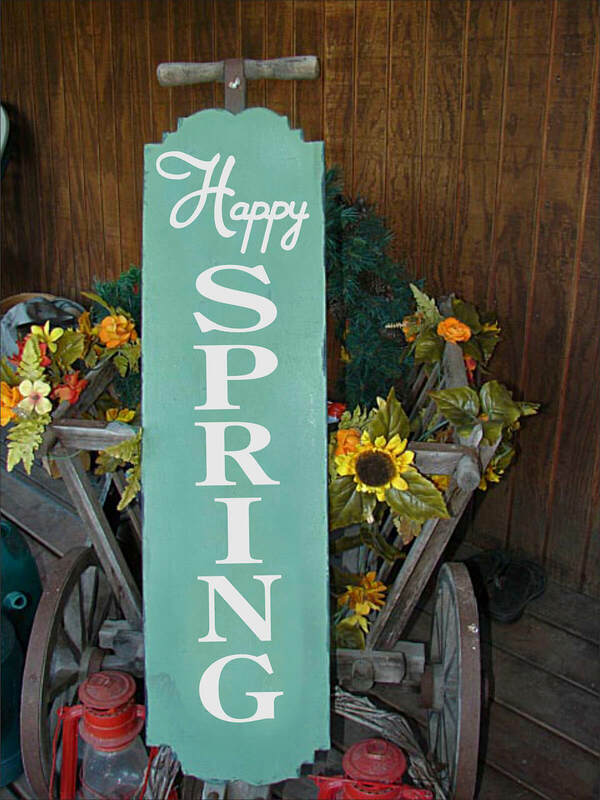 Spring porch signs, in particular, are super in style now. You can find them in local home goods stores, make them yourself, or even find them online and have them shipped right to your house with no hassle and no fuss. 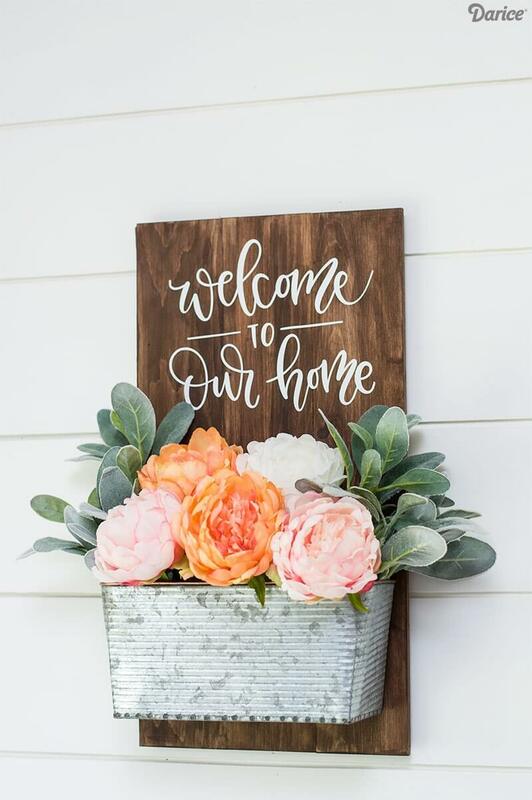 Etsy is an especially wonderful place to find handcrafted and completely unique signs to put up on your porch to welcome friends and family to your home. Whether you want something simple, inspirational, cheeky, or colorful, there is a sign out there that matches your specifications. This little sign is small, simple, and completely adorable. 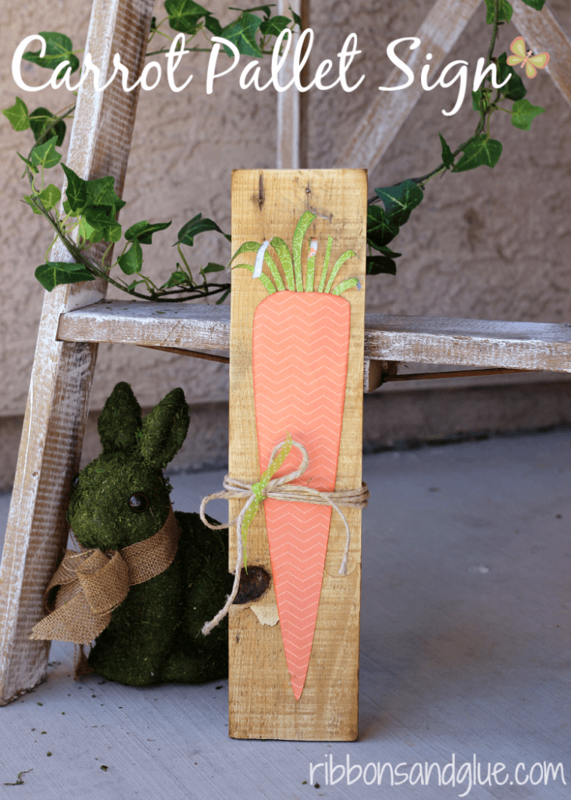 With the cute little wisps of carrot top grass poking out on top to provide a little texture to the adorable chevron design covered carrot, this a great simple and unobtrusive sign to place on your porch for a dash of whimsy and color. 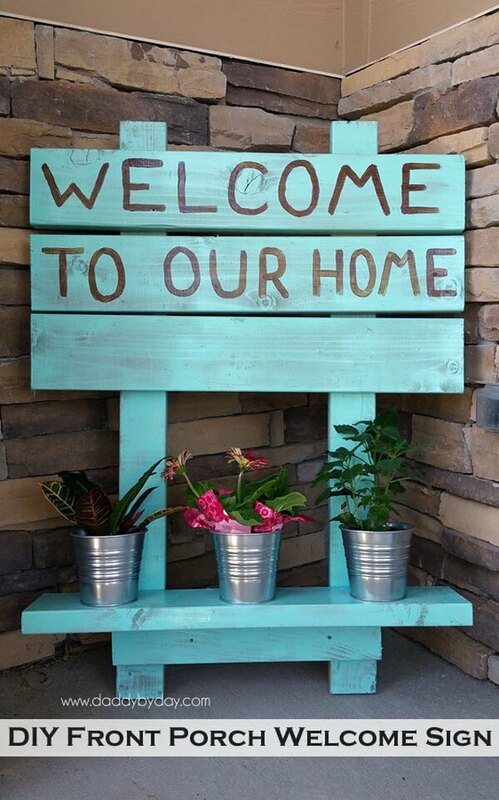 How could one not feel welcome with a beautiful, bright blue, hand-lettered “Welcome to Our Home” sign on the porch? 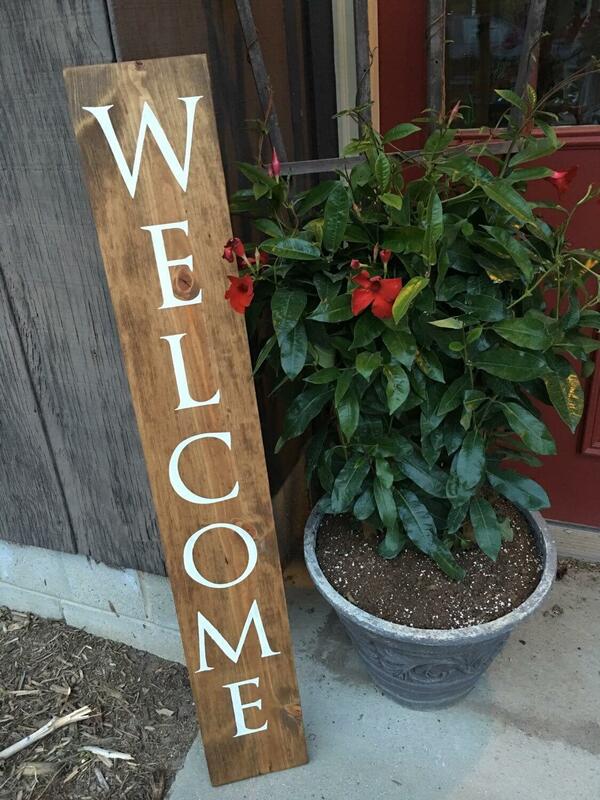 This large sign has a small ledge towards the bottom perfect for placing potted flowers on. The handmade and “imperfect” quality is what makes this particular sign so charming. 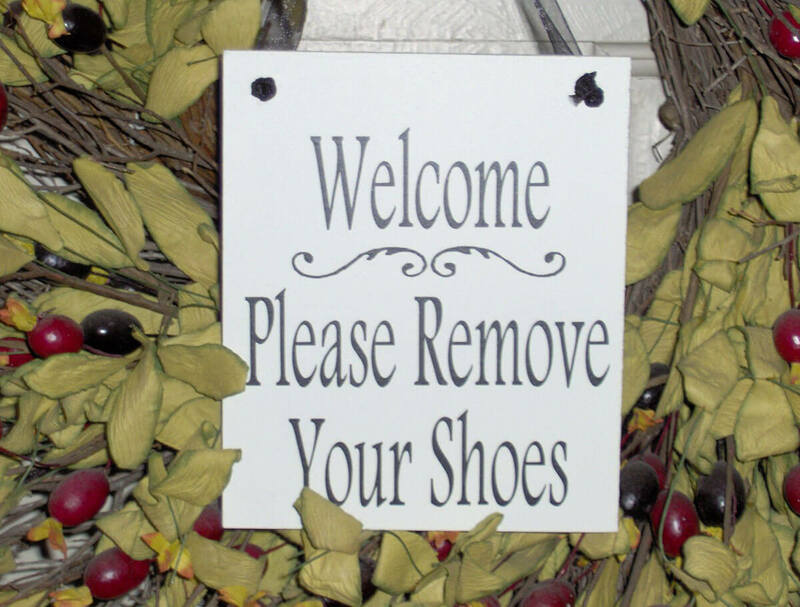 If you have flowers on your porch, why not use this sign as a special touch? This distressed black, medium sized sign has a traditional flower design on it and would look gorgeous hanging on the wall as shown in the picture or propped against a few flower pots. Do you have any kids? If you do, it’s likely there’s a lot of kite flying, puddle jumping, and bike riding going on. This little street post style sign would be perfect as a tongue in cheek way to reference your family activities. The bright blue, yellow, and green, as well as the touch of the ribbons on the arrow points, is just perfect! Are you the type of person who absolutely loves spring and welcomes it with glee every year? 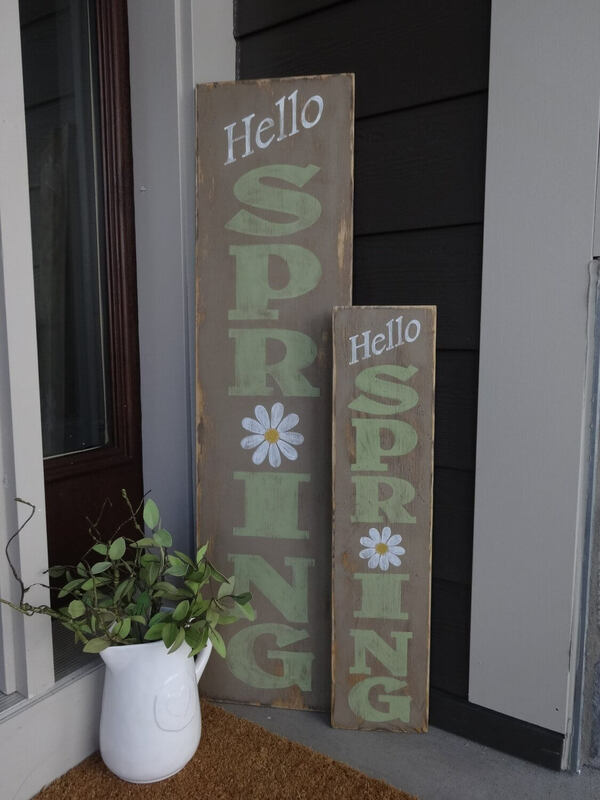 If so, these large vertical rectangular spring porch signs would be perfect to show your enthusiasm. Each sign is quite large, but simple, with only black lettering on a white background. There’s one for spring and one for summer so you can change it up when the seasons turn again. Because of the lack of extra color and design clutter, minimalists will love this as well! 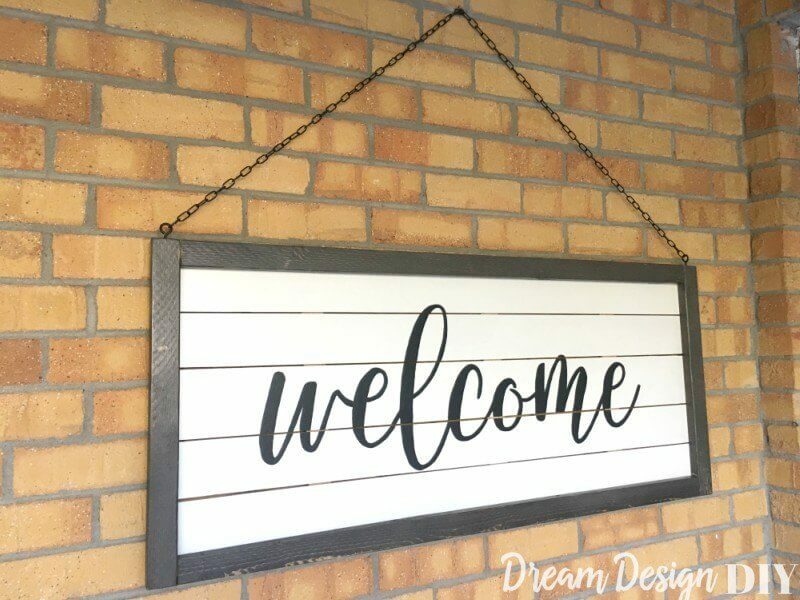 To show your welcome to family, friends, and strangers alike, this little signboard would be the perfect thing to put out on the porch. The simplistic design is appealing and sleek, but also homey and warm at the same time. As demonstrated in the photo, it is great for putting behind some potted flowers or floral arrangements. Need a more unique way to display some flowers and welcome people at the same time? This special, personalized frame with your family name on it can be placed anywhere suitable on a porch and is capable of supporting a large hanging basket of flowers as well. This sign is an interesting combination of a dark wood sign with white slats and a metal chain link to suspend it. The design itself is very classy and simplistic, with a simple cursive “Welcome” painted along the front. It would go well with any kind of background, whether brick as in the picture or wood of any color. 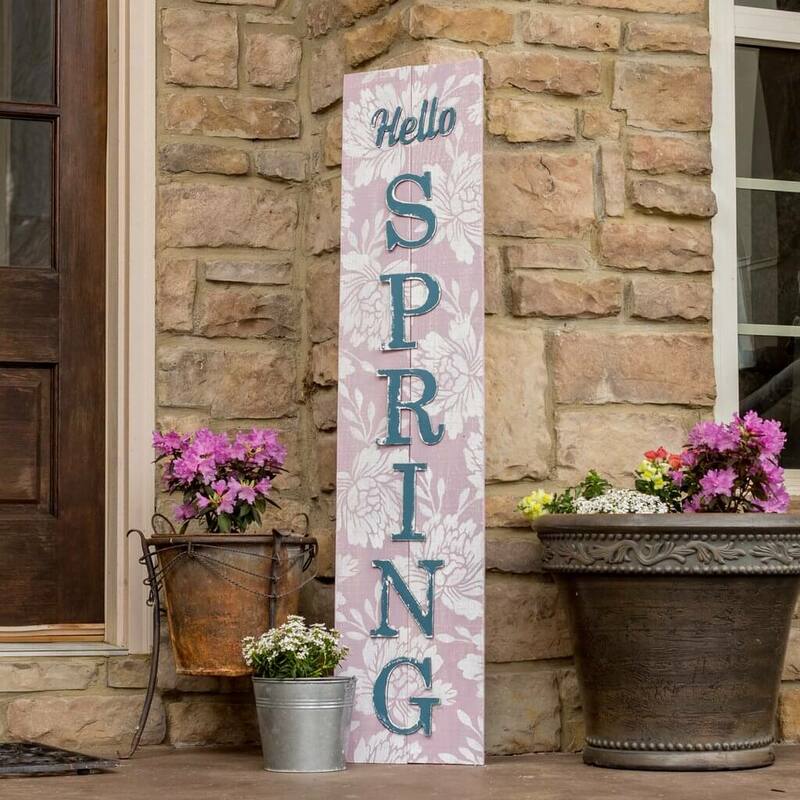 For fans of floral print and texture in their decor, these spring porch signs are the perfect answer. This particular design is quite large, with “Hello Spring” emblazoned on it boldly and an absolutely gorgeous pink-purple background with intricate and complicated floral sketches. This sign is a gorgeous yet simplistic reminder to take things slow and enjoy the everyday moments. The fonts on this black sign are fun, funky, and a little bit childlike. It also comes with two extra pretty designs on the top and bottom. 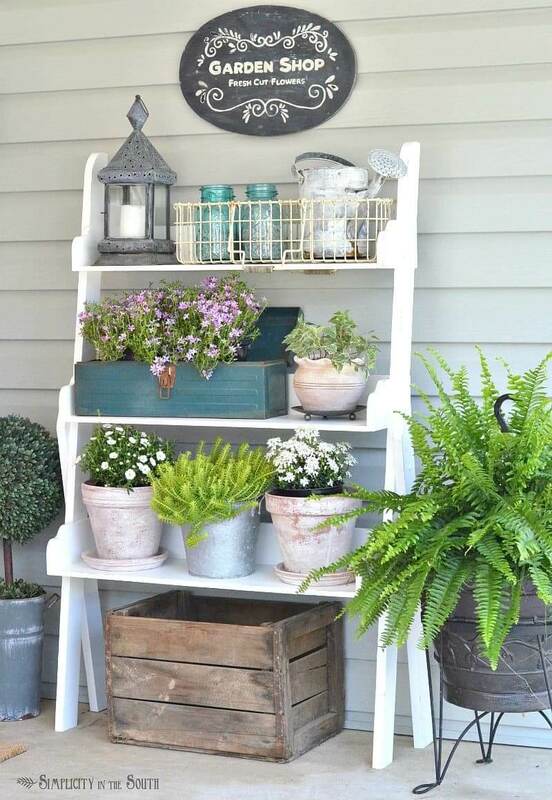 Add a bit of whimsy to your porch! Want something a little more stylish and chic? Take a look at this “Gather” sign! The cursive lettering on top of that criss-cross framed background is perfect for hanging on the wall, especially with two wall flower pots on either side as shown in the picture. 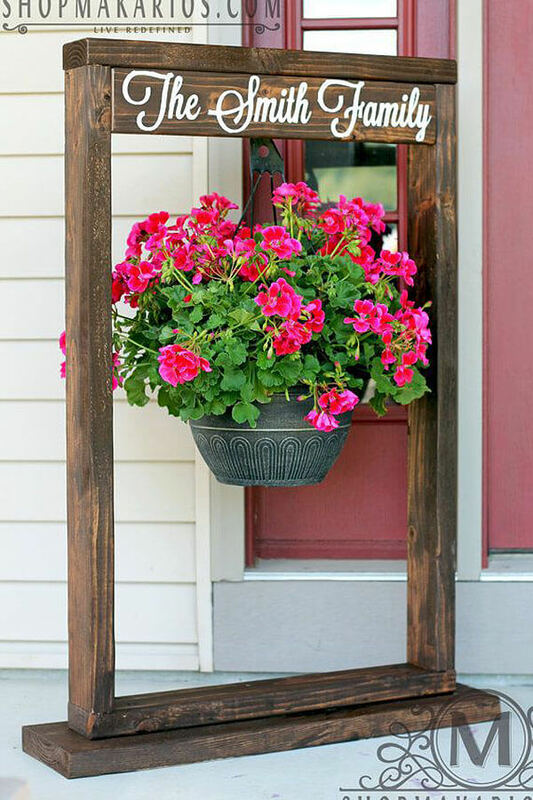 Do you need a dash of color on your porch to reflect all the flowers blooming into life again? 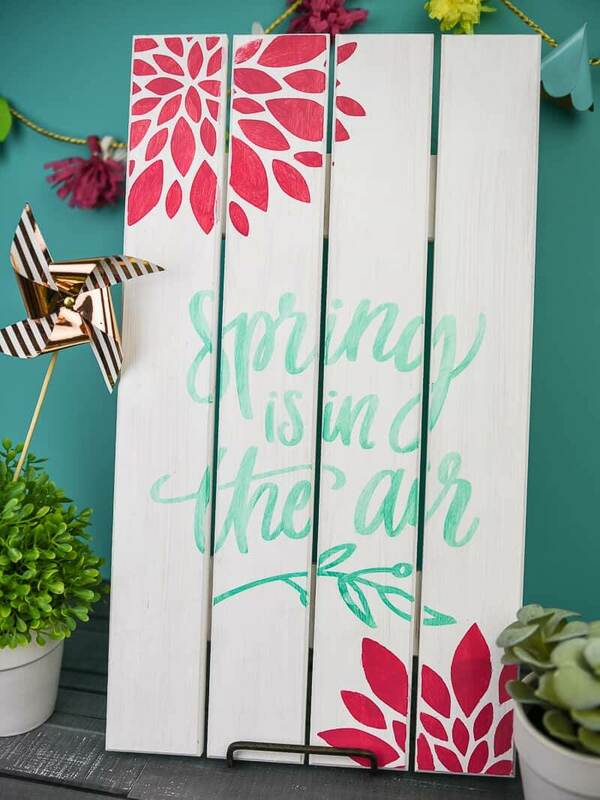 This little hand-lettered cursive “Spring is in the Air” spring porch sign has two gorgeous hot pink blossoms on the upper left and lower right corners, pairing perfectly with the teal lettering. Are you into the new wave of farmhouse chic that’s so popular now? Take a good look at this sign- large, uniquely shaped, and with just the right amount of distress. If you want something that makes a statement and draws attention from everyone entering your house, this is it! 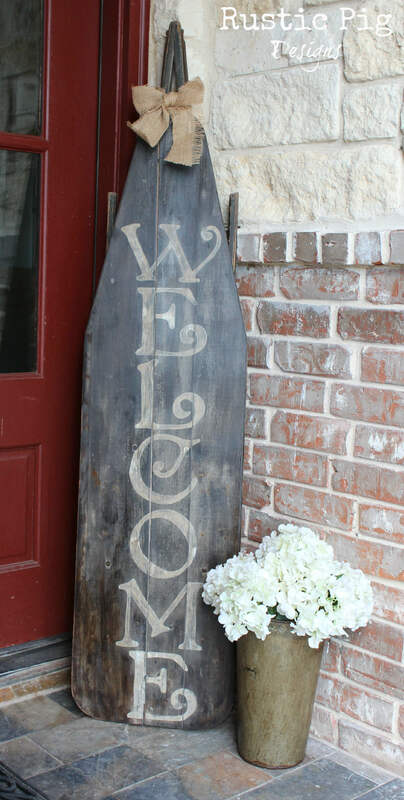 If whimsicality is your thing, this sign could do the trick for your porch decorating. This sign is small and simple, but beautiful all the same. The soft pastel yellow, purple, and blue lettering truly reflect the spirit of the spring season. This little board would look great propped up next to some flowers. 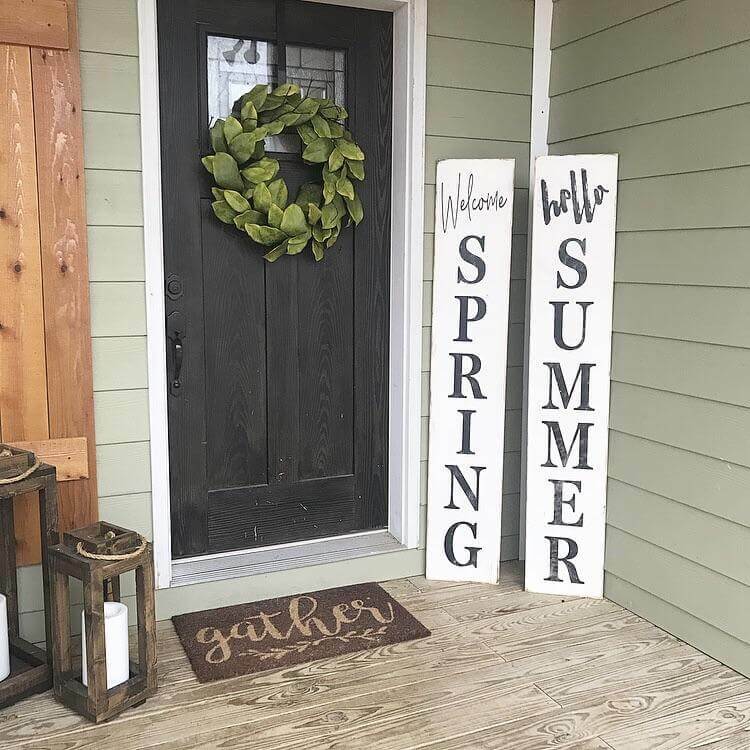 Now, these spring porch signs are a great combination of the traditional cheery spring colors (or rather, color) and the new wave of popularity of the distressed farmhouse chic style. It is large and bright enough to draw some attention, but still has that slightly shabby look that’s so in right now. Not a fan of the whole spring thing? You can still decorate in a charming, classy way! 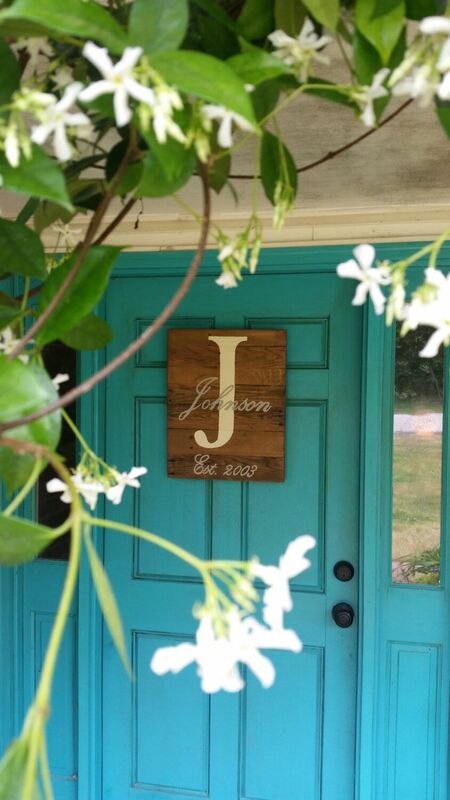 This initial and nameplate sign is perfect to proudly display your family name. 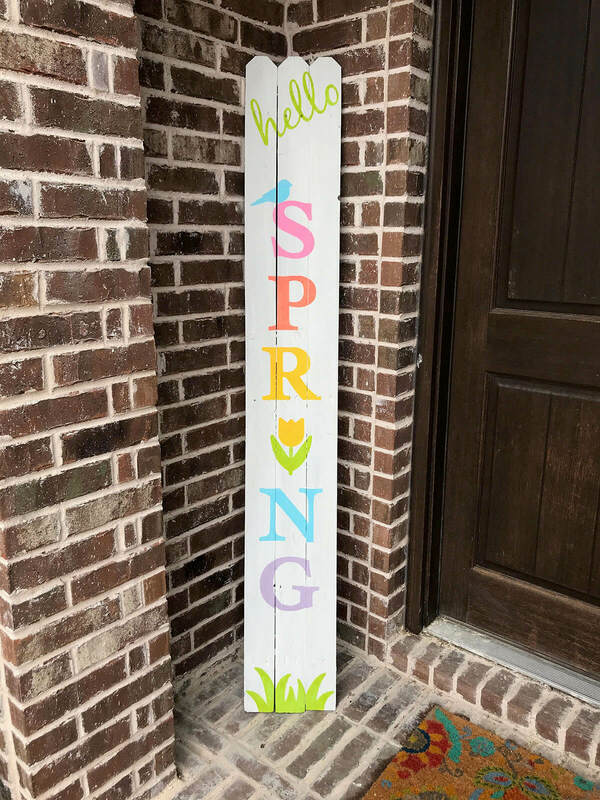 Just pop it right on the front of the door for a beautiful, non-spring related way to add a little character to your porch. Shoes in the house are a big no-no in some households. If this is the case for you and you’re tired of having to gently prod people into respecting your house rules, consider this sign. Hopefully, since it’s prefaced by a cheery “Welcome”, guests won’t be able to disregard it without some embarrassment. Now, this sign is a true masterwork of art! 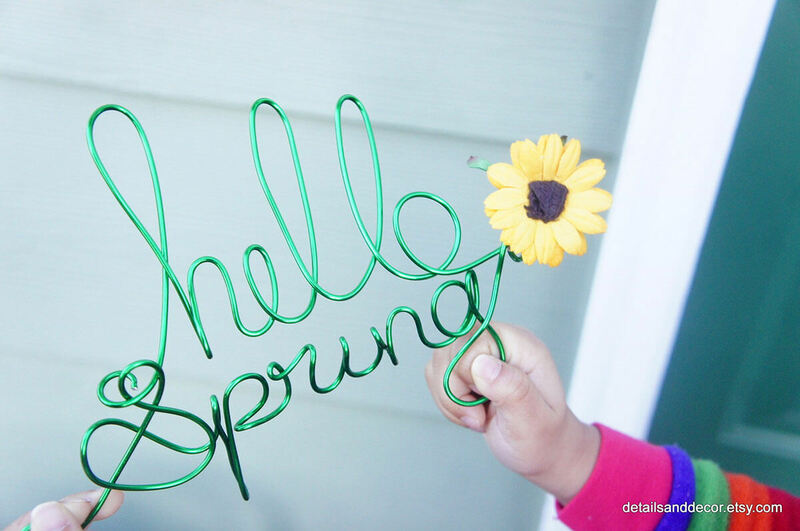 Being twisted to form letters, this bright green wire art spring porch sign is the perfect thing to place on your door to welcome the new season. The cute yellow fabric sunflower placed jauntily at the end is a nice final touch to an already impressive piece of decor. This sign is large but simple. It says simply, “Happy Spring”, a sentiment that most of us can appreciate. The color of the board is not a traditional grass green but more of a teal/aqua color, bringing a pop of brightness to the words. Placed in front of a wheelbarrow of flowers as in the picture, it’s perfectly welcoming. 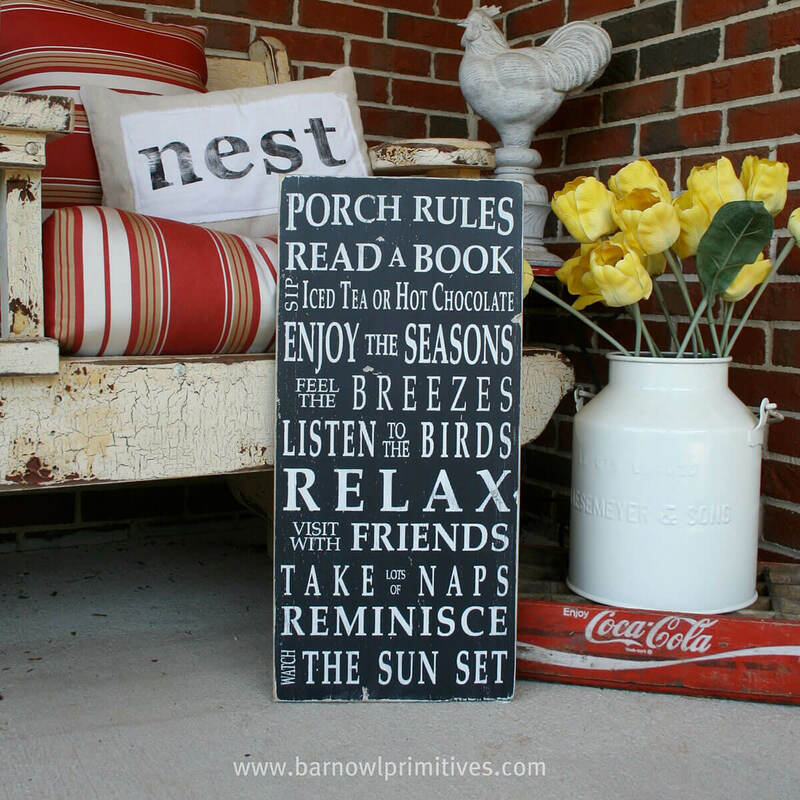 For a truly unique spring decoration for the porch, this interesting cascade of letters just might be the thing. The beautifully painted hot pink pictures of various birds and plants and flowers on the separate letters S, P, R, I, N, G, connected by carefully worked pieces of twine is a very bright declaration of happiness that spring has arrived. This is another sign for those looking for simplicity. Don’t like to mince words or use gaudy colors and designs? A simple “Welcome” should suffice! A large, sturdy, light brown rectangular sign with “Welcome” in bright white, capital letters cannot be missed or misunderstood. 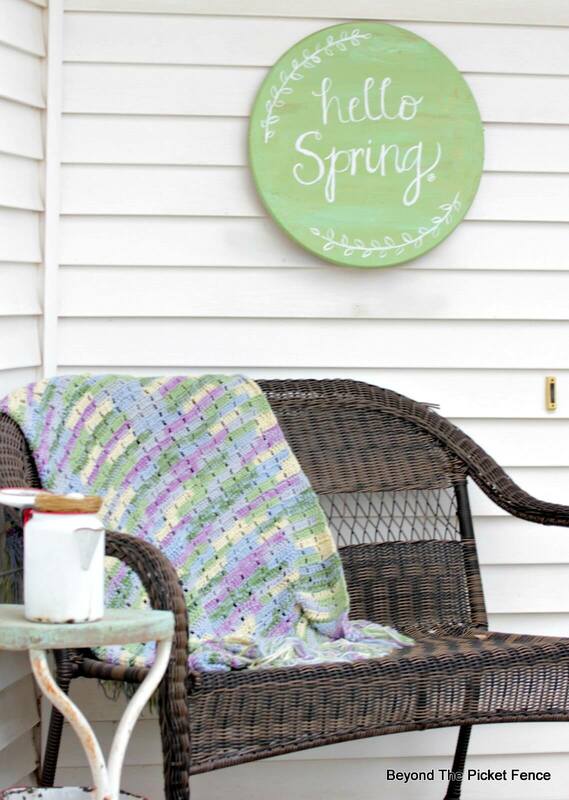 Love pastels but don’t want to overwhelm an entire porch or even one sign with them? 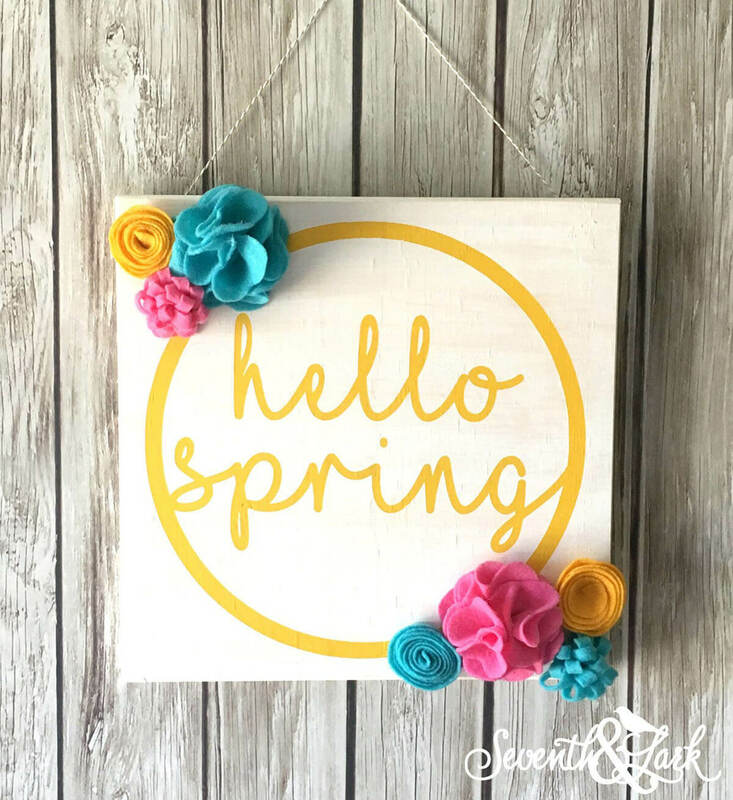 This sign has the perfect ratio of conservative, traditional design and pops of bright spring-like colors to bring out the happy child in you. 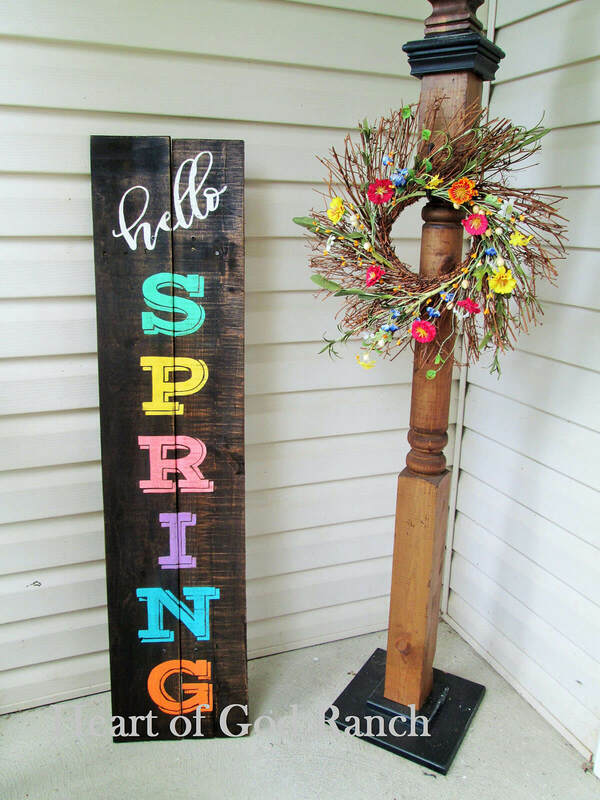 With the cute green, yellow, pink, purple, blue, and orange, these spring porch signs truly declare that spring is here! Want a little 3D pop to your decor? 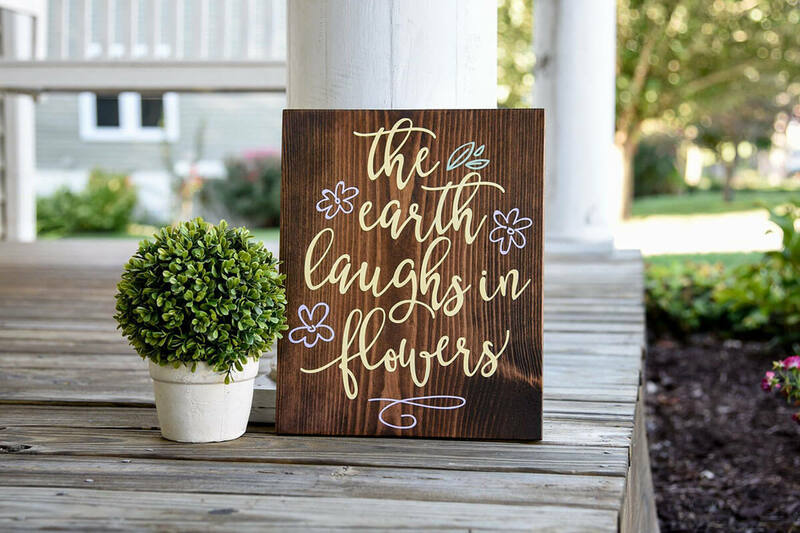 This cute little porch sign has adorable felt flowers on two corners of the canvas, making it the perfect thing to capture a bit of the feeling of nature for people who can’t or won’t plant real flowers. The text itself is bright yellow gives off a super friendly, super cheery vibe. 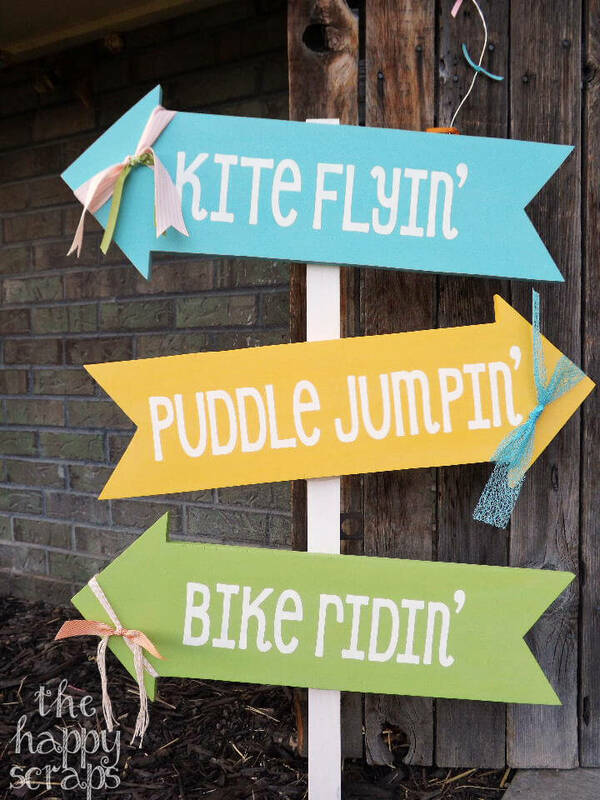 If darker colors are more your thing, but you like your decor to have some color and character as well, these signs just might be perfect. These come in various sizes depending on your preference and can be placed anywhere on the porch you think would have the best effect. Do you love bright colors and want a huge pop of color on your front porch to truly encompass the feeling of spring? This tall sign with a white background has all the colors of the rainbow included in its lettering and the cute, simple little pictures of a bird, a tulip, and some grass. This minimalist, black background, slate-like sign is truly what we all need to remind us to relax. A porch is a place of greeting and welcome, but it can also be a place of sitting and sipping coffee or tea, of reading, of enjoying nature. 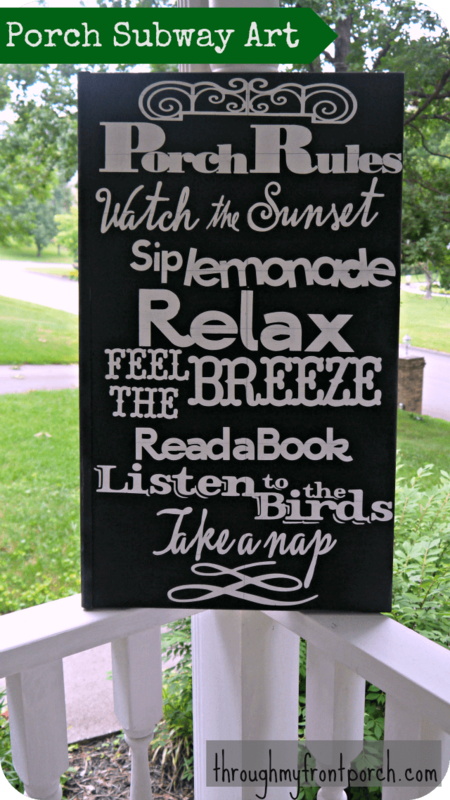 This is the perfect sign to remind us to take a deep breath, relax, and live.